Nature or nurture? The answer, writes Kagan (The Human Spark: The Science of Human Development, 2013, etc. ), eminent Harvard emeritus professor of psychology, is yes. How we think and how we know defines who we are. There is a literalness to this commonplace. Kagan steps outside the mind to look at the body, and the body’s environment, to arrive at some arrestingly apropos observations. For instance, a child who grows up in poverty is likely, in a “robust relationship,” to develop a chronic inflammatory state that yields high rates of diabetes, stroke, heart attack, and the like. Though we do not yet know what it is precisely about poverty that triggers this inflammation, we can reasonably presume that environmental factors are at work. Interior things matter, though. 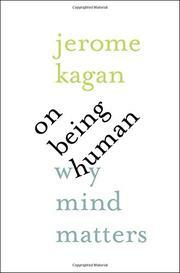 Opening this set of related essays, Kagan observes that “humans are the only species that operates in two realities,” those realities being the “schemata” of sensation and words, the latter of which can be connected to schemata, to real things, but which can also be connected to abstractions—ideas that have reality inside our minds alone. Our worlds are made up of complex networks of words and schemata, Kagan continues, of the natural and the nurtural, and our perceptions are constantly changing. Thus it is that “misunderstandings of a speaker’s intended sense meaning are common because speakers and listeners occasionally activate different networks for the same words.” There’s more to misunderstanding, of course, some of it arising from our addiction to classifying people as greater or lesser beings than we, some from our genetic predispositions, some from where we are in history (for emotions change with time)—all matters that Kagan treats lucidly but not always lightly. Indeed, the author commands a broader range of scientific and humanistic references than most of his readers are likely to, and his book is sometimes challenging, though never unnecessarily so. “Nature is obsessed with particularities,” writes Kagan. A particularly fruitful book for students of the mind.